POLK COUNTY, Fla. — The Polk County Sheriff's Office say two men returned emptied out hard drives filled with Play-Doh to steal over $6,000 from Target. Police issued warrants for 36-year-old Jose Rivera Jr. of Winter Park and 32-year-old Rainer Bentulan of Orlando. Police are still searching for Bentulan, but Rivera was arrested Friday. The Sheriff's Office says Rivera went to 16 different Target stores in the area and bought 69 external hard drives. Bentulan then used receipts to return them, only the hard drives were later found to be full of Play-Doh. "This is certainly a creative twist on a fraudulent return," Polk County Sheriff Grady Judd said. 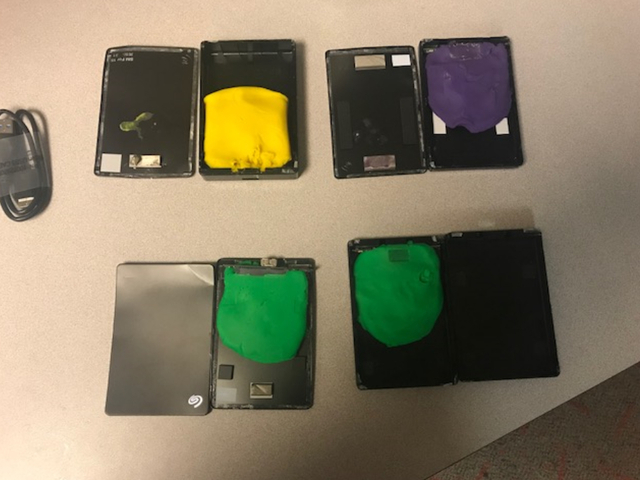 "But you can be sure that when we arrest these suspects, the handcuffs we use won't be made out of Play-Doh"
Police say the suspects took the hard drives and emptied out the contents then filled the shells with Play-Doh and returned them. Police say the total value of the stolen merchandise is $6,159. They are being charged with organized scheme to defraud and conspiracy to commit organized scheme to defraud, according to police. If you have information on the whereabouts of Bentulan, please contact PCSO at 863-298-6200. You can leave an anonymous tip by calling Heartland Crime Stoppers at 1-800-226-TIPS(8477) or visiting the Heartland website . The Polk County Sheriff's Office believes the suspects are in Orange County. They're working with the Orange County Sheriff's Office and Orlando Police Department to find and arrest the suspects. Both men have a criminal history, including charges of burglary and petit theft.